The following article has been reposted for 2018 with updated thoughts about how to embrace the social media app. If you play fantasy football and you're not on Twitter, you're hours (if not a full day or two) behind your competition in getting actionable information. Twitter has a bad rep among those who don’t use it and sometimes, it’s well-deserved. But when used correctly, it’s not only the best free resource for fantasy football but one of the best free educational resources about the game and many other subjects. This post will help you set up Twitter for your fantasy football leagues. It will also help you use it as a tool rather than letting it use you, which is what happens to those on Twitter who don't make the effort to maximize it's potential and minimize its pitfalls. Before I do, let me remind you that I’m not some twenty-something reared with a cell phone in my hand. I don’t hate technology. A truer statement is that I’m not often a first adopter. NFL beat writers share information from the sidelines of training camp. Coaches, trainers, and analysts provide in-game and real-time analysis of the video. Independent analysts delivering great content that's often superior to what you'll see between insurance and pizza commercials on television. Rich discussion about the game happening at all hours of the day among fantasy analysts and fans. The opportunity to interact with writers, reporters, players, and NFL staff. Despite the rise of Football Twitter, many have a love-hate relationship with it. They love the resource and hate the website’s platform. Experiencing Twitter directly from the site is like being at a huge music festival with thousands of fans, sweat-soaked from 90-degree heat and pressed chest-to-back while grooving to an unending vamp of a jam-band for hours on end. Phishhead Sigmund Bloom revels in the energy of Twitter in its raw state. Me? I smell patchouli and the kind of funk that can wilt lettuce. Unless you are like Bloom, Twitter in its raw state is a bad trip, inducing information overload, disorientation, and anger. The speed, emotion, and often the redundancy of the information spilling onto the screen can drain most mortals—and it’s not just fantasy owners. Numerous football writers have confided to me that they routinely suffer from Twitter burnout. All of them were using Twitter like Bloom. Most of them felt much better once they created a filter for their Twitter experience. If you follow these steps below, you'll refine Twitter into a valuable news and educational resource without the noise. If you don’t have an account, go to www.Twitter.com and follow the instructions for signing up. If you work better with visuals, here’s another page that will also do the trick. Once you’ve created an account, begin following people—lots of people. Follow those who cover football and any other subject(s) that you enjoy. Great fantasy football accounts to follow @FBGNews, @SigmundBloom, @JeneBramel, and @Football_Guys (Joe Bryant). Oh, and that Waldman guy @mattwaldman. In addition to the quality content, the @FBGNews, Bloom, and Waldman have cultivated lists of Football Twitter accounts (Direct links: FBGNews, Bloom, and Waldman). @FBGNews will be cultivating these and more lists periodically throughout the year. To create decent lists for your fantasy Twitter experience, follow at least 30-40 football accounts. Don’t add hundreds of people right away. As you use Twitter, you’ll continue adding accounts and refining your lists to your liking. Here’s a professional’s guide with visuals about creating lists. It should help you with the basic nuts and bolts of creating them. The short video below lays out my strategy behind Twitter Lists for fantasy football. To recap, here are the lists fantasy owners should create. The bolded titles are the lists everyone should have. The rest are suggested options that may apply to your playing habits. Of course, there are a lot more lists you can create. Auction leagues, two-QB leagues, and offensive line analysis are examples. Now that you’ve created your lists and cultivated them to your liking, you’re ready to get one of the free Twitter platforms. Use HootSuite or TweetDeck. Both are free products and you can use them on PC, Mac, iPads/Kindles, and smartphones. This is a must-have or else you're going to suffer Twitter Burnout and complain about the medium. Don't be that person who has free resources to turn a raw material into a viable tool and then whine about the rawness of the raw material. 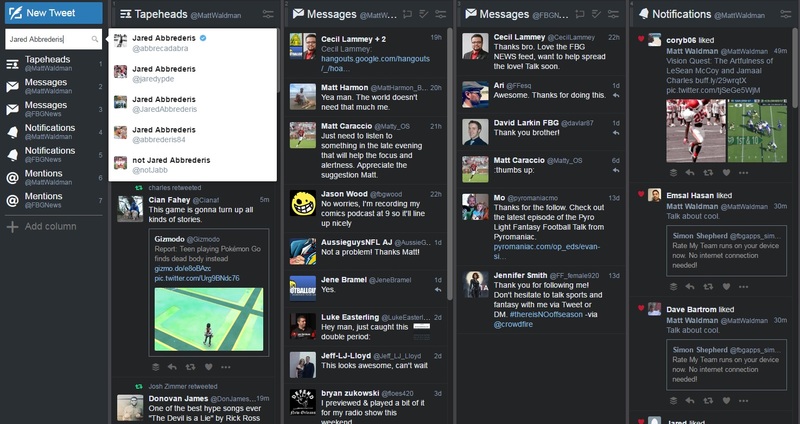 Both HootSuite and TweetDeck have its merits. I use TweetDeck exclusively but they are similar enough that you should have no problem applying my strategy to the HootSuite platform. Once you created a Twitter account, built lists, chose a platform and installed it, you’ll notice that the program has imported columns with headings. I walk you through the customization of your Twitter account below. It's Monday morning and you want to learn what's being written about former Keke Coutee's 184-yard day against the Seahawks. Or, it's Sunday at 11:50 am and you're looking for analysis on how well a gimpy and questionable Odell Beckham moved around during his warm-ups for the cold-weather tilt in Denver. Or, it's the afternoon of your draft and the Denver loses Case Keenum for three months after a binge night gone wrong at Beau-Jo's Pizza you're wondering about Chad Kelly because you liked his preseason performances better than Paxton Lynch, who is engulfed in an off-field controversy. 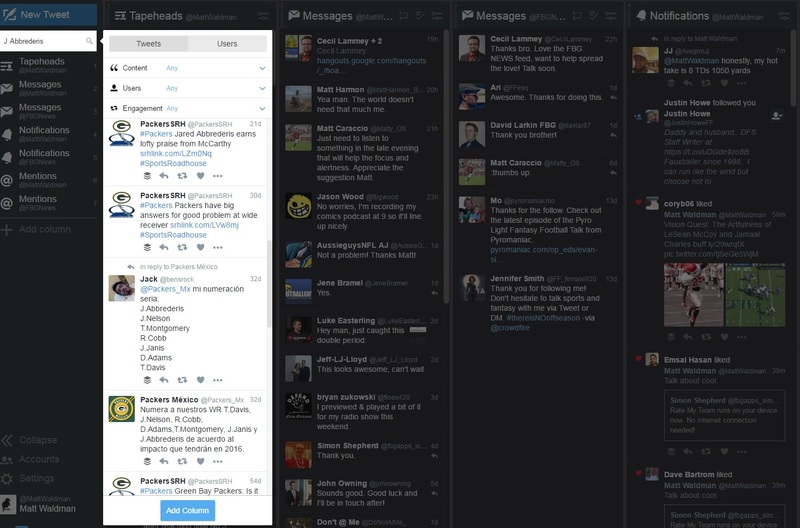 TweetDeck or HootSuite's search button will do the trick. Type in the name in the search button and click "enter". Note that as I type "Jared Abbrederis" the search will bring up specific account names. You can click on one of those choices as a search but you'll only get a list of tweets where the specific account is mentioned in it. I recommend not choosing one because you'll miss a lot of worthwhile content that didn't include Abbrederis' account. Few writers I know take the time to type in the Twitter account of players they're writing about. Instead, type "J Abbrederis" or just his last name and you'll get a list that you can add to your Twitter platform as a column for monitoring until you want to remove it. You can even curate your search with the Content, Users, and Engagement sections at the top of the white search results column. Now you can stay up to date with Abbrederis' attempt to claim a significant role with the Packers. That's it. In addition to the lists above, here’s one more good list—Footballguys Staffers. If you have additional questions, feel free to hit me up on Twitter @MattWaldman. Whether you're a fantasy player, writer, or someone whose social image is a significant part of your business, Twitter is a unique environment that requires nurturing. If you make the effort on the front-end to create lists and customize channels, you'll create a flow of information that fits your style of consumption and interaction. More often than not, any big news will be retweeted by multiple people you follow, which is reason enough to create lists and channels that have fewer users. Otherwise, you will learn why Twitter is known for annoying and abusive behavior. The immediacy of the outlet and character limit of the messages often leads to raw emotions and unrefined behavior from those with a false sense of security hiding behind a screen feeling like they can say anything without consequence. For individuals who don't care about cultivating a following or establishing relationships, this has some truth. If you want to be a troll, you can be one. For people who accurately represent themselves, a business, or a brand, it's a different story. Even so, you'll encounter some accounts who make it a point to be combative, snarky, and heel-like. That's their schtick and there are audiences for it. To pull it off well requires a level of expertise that is admirable for the skill and discipline to behave in that fashion all the time. Few do it well without it backfiring in a big way. If you don't want to deal with troll-like behavior or antagonistic individuals, you can mute or block them from access to your account. Muting the user allows the user to follow you and see your tweets but you won't see his or her tweets. Blocking prevents them from seeing or account or engaging with you and it lets the individual know you've barred them from access to your tweets. I would recommend using those functions responsibly. If you're sensitive to criticism and easily prone to defensive behavior (unfortunately many people who are, don't accurately see it in themselves so I'm not sure why I'm bothering to say this) it is best that you don't engage in ways that will lead to criticism. Otherwise, you'll be blocking and muting a lot of people. If you're a writer, expect criticism. Now there's a difference between criticism and antagonism. My advice for the latter is, don't respond. When you respond to someone trying to antagonize you, you're giving them the power by showing that their opinion matters. If you're not going to listen to that advice because it can be difficult for many to do, write a response on something other than Twitter, take an hour away from Twitter and see if you'd still put it on Twitter when you return. The accounts with traction and happy followers are owned by people who can be the best version of themselves (which is different than putting on an act) even when they're expressing a range of emotions or reactions to positive and negative events. As a result, their followers gradually develop an accurate feel for their sense of humor. I know that I can joke or even make fun of some colleagues or long-term reasons on Twitter because they know it's a playful thing. But it took some time to cultivate that trust. Accounts with traction engage in debate but they know when to let go of an argument without it degenerating into something immature because they know when looking right isn't as important as maintaining a respectful conversation. They don't always do these things well, but they know when to apologize if they've crossed a line. They also ask followers for their opinions and respect them when given, even when they're not sought. The environment is easy to write things without considering the collective memory of your audience or taking the time to carefully craft the words so they can't be misconstrued. Firing off a tweet in response to someone in a casual way could be taken in a harsher tone than intended. I've seen many users think they were far more humorous than they can across to another user only to realize their mistake after a long series of tweets to straighten out a misunderstanding. Twitter is little more than accessing a crowded public place. Fortunately, it allows you to create the environment you wish to have and who you invite to it. The patient cultivation on the front end is worth it.